Currencycloud Direct is our white label payments platform built using our APIs to give you a complete, out-of-the box payments solution. Whether you’re a big company, a SME, or a start-up, Currencycloud Direct can work for you and your customers. Easily manage and automate tedious payment processes so your business, and your customers, can keep pace with the rate of change. No more infrastructure headaches. Built for businesses that want to get to market quickly, we’ll get you up and running in no time, no integration required. 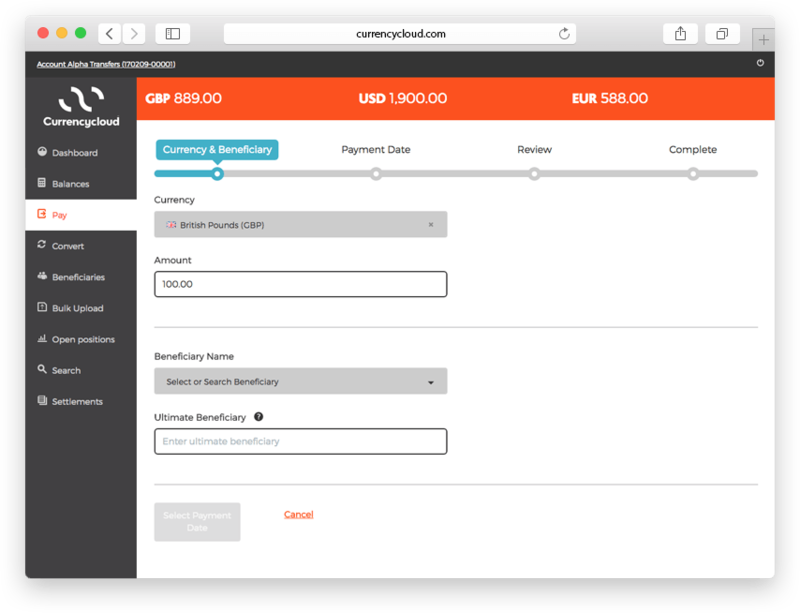 With everything pre-configured, you can personalize our UI in your own brand to launch faster and simplify payments. Sign up new users on your platform and process payments with ease. Give your customers a superior experience. 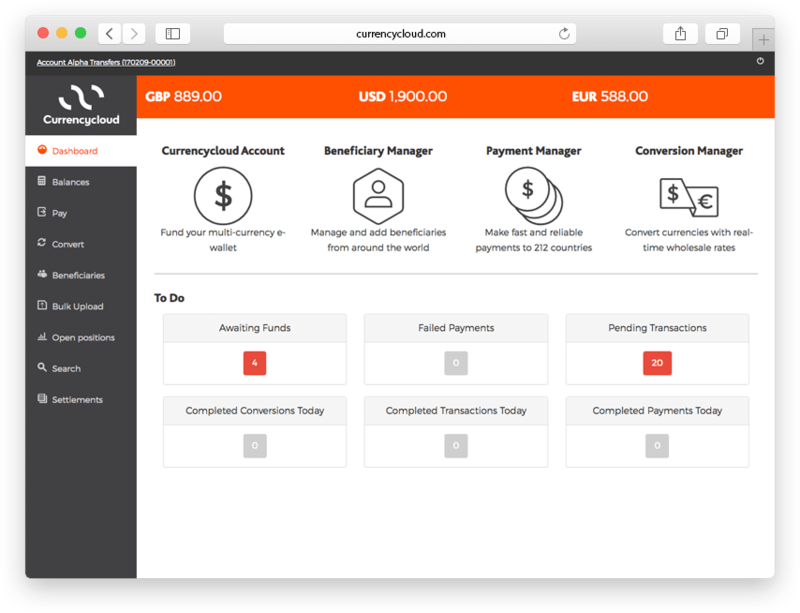 Facilitate complex money movement, make conversions and payments in bulk, and transfer money between Currencycloud Accounts. Want to know more about the APIs that underpin Currencycloud Direct? Take a peek under the hood for more details. 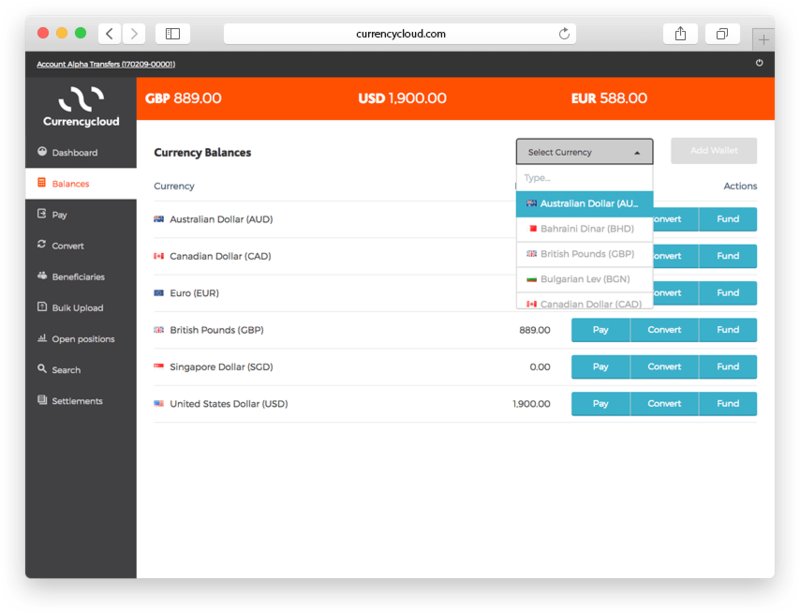 Before Currencycloud, we relied on bank transfers or PayPal for international payments. Our company was hit with huge expenses, frustrating time delays and the pain of manually entering each transaction. We required an automated, scalable solution to reduce friction and cost. The tipping point for us came when we started experiencing rapid growth and gaining high-revenue customers by partnering with Currencycloud. We have a super fantastic working relationship with the whole Currencycloud team. They are always on call whenever we need them. I’d strongly recommend Currencycloud to any company that needs a one-stop-shop solution for B2B international pay-outs that are low cost, good quality, streamlined and optimised. MANGOPAY evolved out of the success of Leetchi.com, our leading consumer online payment service that collects and manages money for group events. After launching Leetchi.com in 2009, we quickly recognized the vast need for our payments technology and began offering it to C2C, B2B and C2B businesses under the name MANGOPAY in 2013 to specifically serve the fast-growing collaborative economy. Launching our own FinTech company, we always knew we would face challenges. Thanks to Currencycloud, we were able to avoid additional regulatory or technology hurdles, by relying on its ready-established, compliant platform. The Currencycloud team has been there and done it – they get the start-up mentality and made the whole launch process easier for us by adapting to our timelines and requirements. We have a dedicated relationship manager, and I’ve enjoyed working with every member of the Currencycloud team that I’ve met. The main reason that I’d recommend them is their flexibility and agility in being able to adapt an existing product to new and different business requirements, and proactively engaging with our international growth plans. No hidden costs or nasty surprises here. We have a number of flexible pricing models to meet your business’s needs. Make domestic and international payments in 35 currencies to 212 countries.